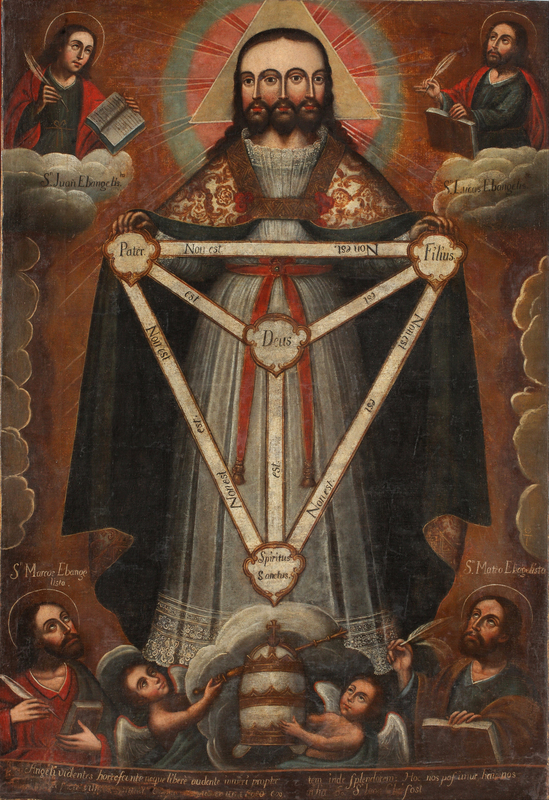 Painted by an anonymous artist of Peru’s Cusco School in the mid-eighteenth century (c. 1750 – 1770), this work sought to represent the Roman Catholic doctrine of the Holy Trinity. The typology—known as a Trifacial Trinity—had been banned by the Church in Europe, but was used in the Americas because it was seen as an effective device for representing the truth of this sacred mystery. This entry was posted in Uncategorized and tagged 18th Century, Art, Christianity, Painting, Peru, Religion. Bookmark the permalink.